Front row: Lisa Ebesugawa, Brian Tada, Lauren Pacheco, Kaipokoka Aurello, Robert Kamau Jr., Conrad Bidal, Isaac Michaels. Back row: Isabell Feki, Joshua Willing, Joshua Rodby-Tomas, Bryan Young, Christopher Huff, Elik Vodovoz, Kyung Yu, Kamuela Akana. 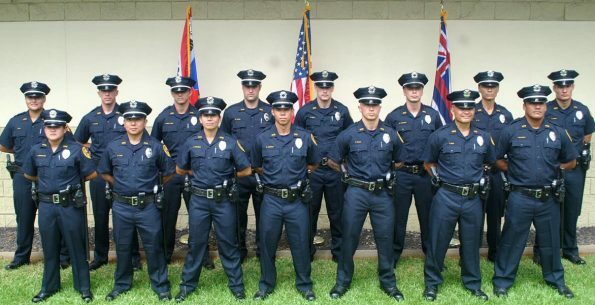 Members of the Hawaiʻi Police Department’s 84th Recruit Class received their badges Wednesday morning (August 31) during a brief ceremony attended by about 90 friends and relatives. The ceremony was a substitute for a larger luncheon ceremony that had to be cancelled because of Hurricane Madeline. Knowing that friends and family, including some from the mainland, would be disappointed if the recognition ceremony was called off altogether, the Police Department’s training staff made last-minute preparations to hold a shorter ceremony earlier in the day to allow everyone time to return to safety before the storm intensified. During the ceremony, Chief Harry Kubojiri issued the reaffirmation oath to the recruits, and Class President Joshua Willing made brief remarks. The highlight was when someone special to each recruit pinned on that officer’s badge. Two recruits received special recognition for excellence. They were Class Vice President Kamuela Akana, who excelled in firearms training, and Class Secretary/Treasurer Kyung Yu, who excelled in academic training. The other members of the 84th Recruit Class who completed the first phase of training are Kaipokoka Aurello, Conrad Bidal, Lisa Ebesugawa, Isabell Feki, Christopher Huff, Robert Kamau Jr., Isaac Michaels, Lauren Pacheco, Joshua Rodby-Tomas, Brian Tada, Elik Vodovoz and Bryan Young. The recruits, who just completed six months of intensive training, will now undergo four months of on-the-job field training with veteran police officers before they are qualified to work alone.